[April 05, 2007] Marjorie Ruth Caldwell, 80, of Lincoln, died Monday, April 2, 2007, at the Christian Village. 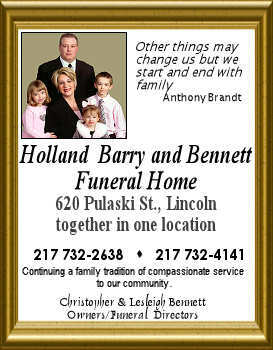 Burial will be in Elkhart Cemetery on Monday, with an 11 a.m. service led by Jerry Pippenger. Ms. Caldwell was employed at GE in Decatur for several years and was the Logan County dog catcher for many years. She was born May 28, 1926, in Lincoln to Edward J. and Ruth Haoglin Warrick. She is survived by three nephews, James Pippenger, Jerry Pippenger and Rob Pippenger. Her sister, Marianne Pippenger, preceded her in death. She was a member of Lincoln Christian Church. Memorials may be made to the Alzheimer's Association. Click here to send a note of condolence to the Caldwell family.